Eliminate unsightly fuzz and lint on-the-go. 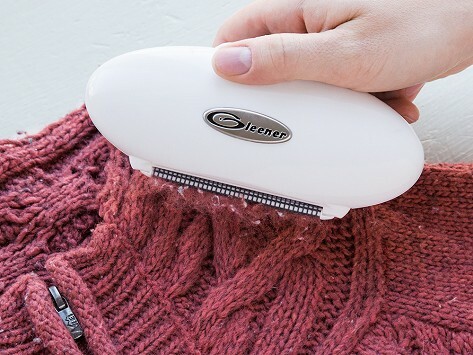 This fuzz remover comes with interchangeable fabric-sensitive attachments to get rid of fuzz, pills, and balls from almost any kind of fabric, fiber, or knit. Dimensions: 7" x 4" x 1.75"
So far love this sweater de-fuzzer, works as advertised! An awesome take along gadget! I’ve purchased the regular gleener and was very impressed. When I noticed the small version it went into my cart. Gleener has a solid reputation for getting rid of fuzz balls, pills, and hair on your clothes and furniture. We discovered Gleener back in 2012 and our community still gives it high marks for refreshing sweaters and couches. When Maker Kim Cole was pregnant, she was fixated on getting rid of clingy fuzz balls on all her sweaters and knits. The device she’d used before left holes in her favorite sweaters. She wanted something finer that would adapt to different fabrics and Gleener does just that. One Edge takes care of the heavy duty de-pilling bulky sweaters, while another is a gentle worker for more delicate cotton and silk blends. 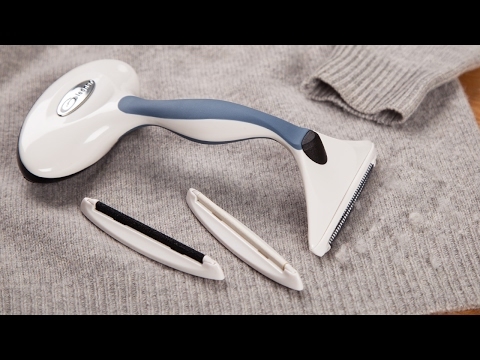 Once you’ve de-fuzzed, you can de-hair with the pet hair attachment and even de-lint. This is an easy way to increase the lifespan of your favorite knits and keep them in a minty condition for way longer.